Here is a baby gym that will grow with your child. 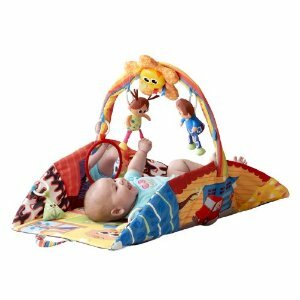 It comes with 5 removable toys, folds up into a playhouse (that an older baby would enjoy playing with), lays flat for an infant, and packs up into a nice little package for easy storing and transporting. There are baby-activated music and lights, but not of the offensive/annoying variety.